The ASEAN-Japan Centre conducted a “Follow-up Training Program on Interpretation” in Luang Prabang, Lao PDR, jointly with the Department of Information, Culture, and Tourism, Luang Prabang Province and GIZ’s project “Luang Prabang – Handle with Care-”. This program was a follow-up activity of the training program on interpretation* in Japan, which was conducted in November 2018, in Tokyo and Shizuoka, with the participation of the site managers of national parks/natural heritage sites and officers from national tourism and natural resources management offices from eight ASEAN Member States. Ten participants from the ASEAN Member States who joined the training in Japan last November further deepened their understanding on how to utilize interpretative methods to improve the tourism services/management of the heritage sites in their respective countries. 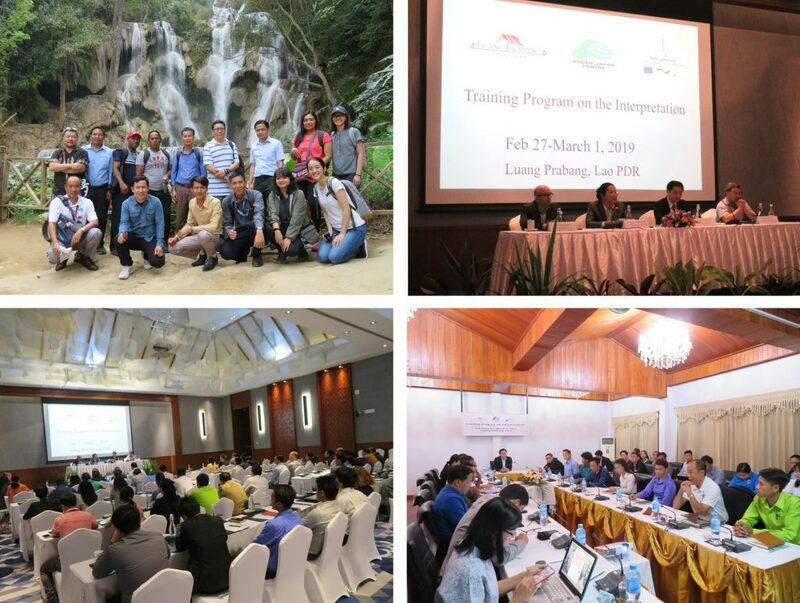 The training program included site visits of the UNESCO World Heritage city of Luang Prabang, a seminar and training workshops facilitated by a Japanese expert. Almost 50 local tourism stakeholders in Luang Prabang, including provincial tourism officials, tour guides, tour companies, tourism association and trainers from universities/technical colleges participated in the seminar and workshop. The program included the site visit to Luang Prabang Heritage City Walk and the Kuang Si Waterfall/National Park which are the major tourist attractions of the city. The lecturer and the participants discussed how to improve the techniques of the tourist guides using interpretive methods, and ways to promote the responsible tourism activities together with local communities. At the end of the workshop, all participants joined the group discussion to design eco-tour programs using the actual examples of the Luang Prabang area, where they received concrete advices and coaching from the Japanese expert to improve their skills in tour product designs. This program is endorsed as one of the Mekong-Japan Exchange Year events by the Ministry of Foreign Affairs of Japan. * Interpretation is a communication approach that addresses management needs and resource consideration to offer an essential guideline for the development of quality visitors services at heritage sites or facilities, and can be described as a strategic tool for operation and management of the sites.